Flagon capacity: Approx. 32 fl. oz. This is our communionware in the Memorial pattern. All pieces are wheel-thrown (not molded) stoneware. We've tried to create something rustic and attractive which will give a feeling of age and simplicity to the table. 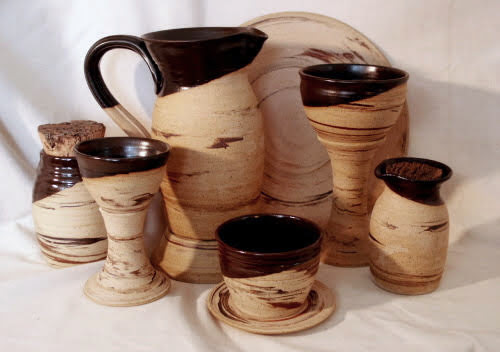 It is a combination of earth-tone colored clays, glazed only on the inside and rim of the vessels, in a dark brown. This is our most rustic-looking design - warm, earthy, un-polished, and very one-of-a-kind. We feel that it seems to convey a sense of history, and like to imagine that it might resemble the pottery that Jesus would have used at the Last Supper. Though it is made of sturdy stoneware, it has an earthenware appeal. This pattern is called Memorial for the church where Debra grew up, Memorial Christian - where each year the "Lord's Supper Scene" dramatic presentation was presented. See Upper Room Set for the cup and plate set. The variegated coloration in the unglazed clay will be different in each piece - expect variations! The chalice and plate (back row above) are the same size as in our congregational sets (see Congregational Sets.) The smaller vessels are available as travel communion sets or individual items. See Travel Sets. Ideal for worship services, retreats, weddings, hospital visitation, Emmaus Walks, and home communion service use.